Scientists have come up with a gallery of rogues to explain an epidemic of kidney disease in Central America. But the culprit has stayed one step ahead. Beat the heat. Cane cutters in El Paisnal, El Salvador, start work at the break of dawn to take advantage of the cooler morning hours. SAN SALVADOR AND USULUTÁN DEPARTMENTS, EL SALVADOR—A half-hour before sunrise, Emmanuel Jarquin pulls his four-wheel-drive pickup off the road near the rural town of El Paisnal and rumbles onto a sugar cane field. Jarquin, a physician, parks and steps into the sweet and smoky air, the cane having been charred the day before to burn off leaves and thorns. He walks toward the headlamps of several machete-wielding men who will start cutting at first light. “What are you bringing us?” one of the men cries in the darkness. “I’m bringing you health,” Jarquin replies. Jarquin collaborates on a project studying a mysterious affliction of Central American agricultural workers known as chronic kidney disease of unknown etiology (CKDu). First reported in 2002, CKDu has no known links to diabetes or hypertension, the main causes of progressive renal damage worldwide. Much about CKDu is clouded by sketchy health statistics and the difficulty of distinguishing it from other kidney disease. But it appears to be spreading in the hot lowlands of Central America’s Pacific Coast—and concerns are rising. In October, the Pan American Health Organization (PAHO) declared CKDu a “serious public health problem,” with case reports streaming in from southern Mexico, Guatemala, Honduras, Nicaragua, Costa Rica, and Panama. 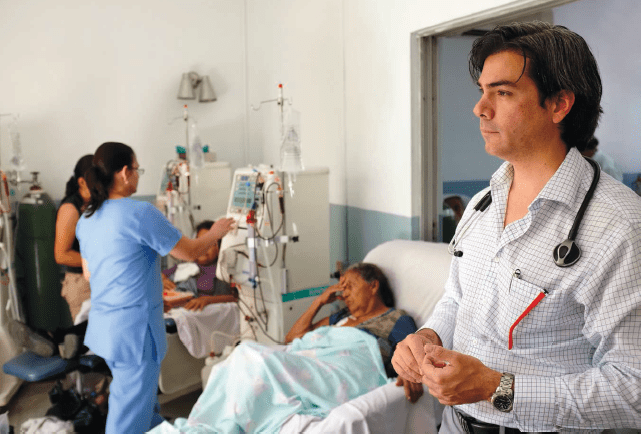 In El Salvador alone, PAHO’s latest figures say chronic kidney disease of all causes kills at least 2500 people in the country each year, and it’s the main reason adults die in Salvadoran hospitals. The disease follows a peculiar pattern. It’s about three times more common in men than in women. Cane cutters have been especially hard hit, but it’s killing other agricultural workers as well. Whereas traditional CKD is mainly a disease of the elderly, CKDu disproportionately strikes young adults, especially those who toil long hours in the heat. But like its more common cousin, CKDu inexorably destroys the kidneys until they can no longer filter waste from the blood, forcing victims to receive dialysis or a kidney transplant to survive. For many poor agricultural workers in this region, such costly treatments are out of reach. As public health officials struggle to cope with what many are calling an epidemic, the origins and cause of CKDu remain a stubborn riddle. Possible culprits include dehydration and heat stress, pathogens, agrochemicals, heavy metals, a biochemical disorder, nonsteroidal anti-inflammatory drugs, antibiotics, low birth weight, and genetic susceptibility. Just as with a similar illness in the Balkans that baffled scientists for decades (see p. 146), hard data are scarce and strong opinions are abundant. It’s also difficult to disentangle the science from politics. 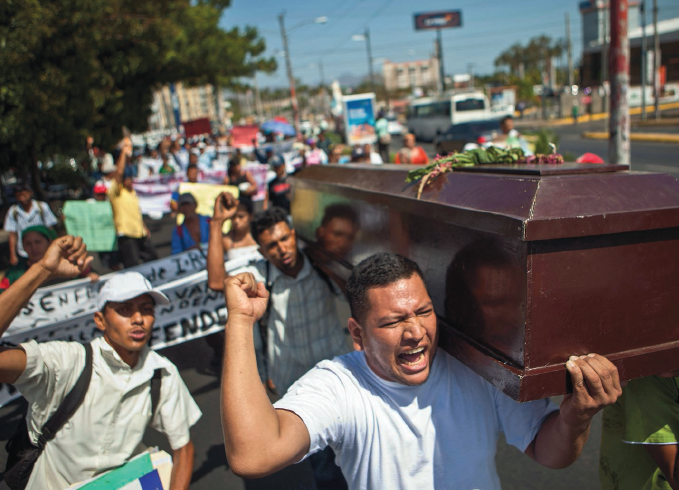 In Nicaragua, former sugar cane workers with the disease and their families have staged demonstrations demanding compensation, igniting violent showdowns with police that included a fatal shooting of a protester in January. Early detection. Ramón García Trabanino, who now runs a dialysis center in San Salvador, reported a rise of a baffling chronic kidney disease in 2002. Osmin Sorto, 49, lives in Tierra Blanca de Jiquilisco, an agricultural community near the coast in a region of El Salvador called Bajo Lempa, and says he has watched more than 100 people die of CKD. He could easily have been one of them. At 15, Sorto started harvesting cotton and planting flags for crop-dusters, but at 22 he landed a plum government job, complete with health care. His kidney problem came to light in 1998, after a doctor’s visit for an inflamed toe. Tests revealed gout due to high uric acid levels, and his doctors started closely monitoring his kidney function. He did not have diabetes or hypertension, but by 2005, he had developed end-stage renal disease. Sorto, a classic case of CKDu, was offered a kidney from his sister, and he had the rare insurance plan in El Salvador that would cover the cost of the transplant. Still, he initially was reluctant to accept his sister’s kidney. “I didn’t want to expose her to any risks,” Sorto says. Finally, faced with an imminent death, he acceded, and both are doing fine today. Few CKDu patients are so lucky. Hospital Nacional Rosales, in El Salvador’s capital, San Salvador, is a palatial complex built of Belgian iron in the 1890s. The 525-bed landmark—El Salvador’s largest public hospital—is always full. When nephrologist Zulma Cruz started working there 13 years ago, her ward had 18 beds for peritoneal dialysis, which drains kidney toxins from the abdomen, and 16 hemodialysis machines that do the more sophisticated cleansing of toxins from the blood. Today, the hospital has 85 beds filled with patients on peritoneal dialysis and 90 more coming each day to take turns on 30 hemodialysis machines. Each month, up to 70 new patients with end-stage renal disease show up seeking dialysis; the hospital can offer the life-extending treatment to only a few dozen each month. The others must seek out private care, or, more commonly, return home to die. A young doctor in training at the hospital, Ramón García Trabanino, first brought CKDu to light. “The whole hospital was flooded by renal patients,” remembers García Trabanino, who began working at the hospital in the late 1990s. “I thought, ‘Why are all these people here with kidney disease? It’s not normal.’ ” An adviser suggested he do a study. Over 5 months, García Trabanino interviewed 202 new patients with end-stage renal disease. Medical records and personal histories uncovered an obvious cause for CKD in only one-third of the patients, equally split between men and women. Of the rest, 87% were men and the majority worked in agriculture and lived in coastal areas, he and his co-authors reported in September 2002. Their report in the Pan American Journal of Public Health speculated that patients who had CKD with características peculiares might have developed the disease after exposure to herbicides and insecticides. Health officials took little interest in this greenhorn’s findings. “I spoke with PAHO and I remember them laughing at me,” García Trabanino says. “They thought I was crazy.” The Ministry of Health in El Salvador took no action, but it did give him an award for his study. “The judges must have been drunk that night,” he says. A newspaper article about the award caught the attention of Julio Miranda, a leader of a social fund for health emergencies in Tierra Blanca de Jiquilisco. Miranda’s team contacted García Trabanino and explained that they had seen an extraordinary rise in deaths from kidney failure since the mid-1990s. “Many people thought it was pesticides,” Miranda says. They agreed to collaborate with García Trabanino on a study that would compare men in the Jiquilisco lowlands with men in a region 500 meters above sea level. García Trabanino thought that workers at higher altitudes might be exposed to different occupational and environmental factors. Widespread. Reports of chronic kidney disease of unknown etiology have stretched along the Pacific coast from southern Mexico down to Panama. He could only think of one thing: the heat. Researchers who had documented CKDu in other countries shared his suspicions. In November 2005, the Program on Health and Work in Central America, or SALTRA, gathered García Trabanino and 17 other researchers from six countries for a workshop in León, Nicaragua. The meeting sparked studies in Nicaragua and El Salvador that would survey nearly 2000 people living at different altitudes and working in various occupations. Wesseling is collaborating with a team led by nephrologist Richard Johnson of the University of Colorado, Denver, that has a provocative idea for CKDu’s cause: Repeated dehydration disrupts a biochemical pathway, leading to excess conversion of glucose to fructose. The enzyme fructokinase, which metabolizes the fructose, then creates high levels of kidney-damaging uric acid, oxidants, and immune system messengers that cause inflammation. Johnson and co-workers tested their hypothesis by subjecting mice to hours of high heat at a stretch while restricting water intake in one group but not in another. They repeated the experiment in mice that could not metabolize fructose because their fructokinase gene had been intentionally crippled. As they reported online in December in Kidney International, kidney damage occurred only in normal mice on restricted water, providing compelling support for what some now call the “heat-plus” hypothesis. García Trabanino says the fructokinase hypothesis is “the closest thing to reality we have right now.” But he still suspects that other factors have yet to be identified. So he is launching a new study with Jarquin, the four-wheel-drive doctor, to examine more carefully the differences between people who live in the coast and at higher altitudes. García Trabanino chose to work with Jarquin because he is one of the few doctors who specialize in treating agricultural workers: In addition to conducting occupational health evaluations and training for agricultural companies, he runs a private practice in his boyhood town of El Paisnal, which means he has unusually close ties to the sugar cane–cutting community. The two physicians have unusually close ties to each other, too: García Trabanino’s father, also a nephrologist, treated Jarquin’s father, himself a victim of traditional chronic kidney disease. Next to a cornfield in Bajo Lempa’s Jiquilisco municipality, the epicenter of CKDu in El Salvador, is a small unmarked cemetery with 2 dozen aboveground tombs. Most are recent, adorned with wreaths and fresh flowers. CKD took the lives of one woman and nine men in this graveyard, says local doctor Lilian Núñez. One was her uncle. “This man was diagnosed 3 days before he died,” she says. At her side in the cemetery is Carlos Orantes, a nephrologist at the National Institute of Health in San Salvador—and a skeptic of the heat-plus hypothesis. “We are not obsessed with pesticides, but we do believe they’re at the center of the cause of the disease,” Orantes says. His team’s 2009 CKD study in Bajo Lempa confirmed many aspects of the disease’s demographics. But it left Orantes convinced that pesticides deserve a closer look. Orantes thinks the coastal regions may have more CKDu because the heat increases susceptibility to nephrotoxic effects of the pesticides, the true cause. He also contends that pesticides may interact with heavy metals such as arsenic to poison the kidneys. He points to research from Sri Lanka suggesting that glyphosate in pesticides chelates arsenic, boosting its level in the water and its potential to damage the kidneys’ delicate filtering machinery. And his team has preliminary evidence that arsenic levels are higher in fields surrounding the cemetery than in the nearby village. Cruz of Hospital Nacional Rosales agrees. “We need other hypotheses,” she says. To that end, she and her co-workers teamed up with researchers from the Karolinska Institute in Stockholm to study kidney biopsies from CKDu patients. In a November report published in the American Journal of Kidney Diseases, they described how the disease inflicted consistent, distinct damage on the kidneys in the eight subjects, a finding that many researchers hope may provide a tangible new lead. The biggest CKDu study to date has only fed the rancor. In the center of this maelstrom is epidemiologist Daniel Brooks, who became aware of CKDu a decade ago because his wife worked on a sister-city project connecting Brookline, Massachusetts, and Quezalguaque, Nicaragua. “She said they have this problem of this chronic kidney disease and maybe they need an epidemiologist,” says Brooks, who works at Boston University and had long studied smoking cessation and sunburn protection. Bitter feud. Former cane cutters in Managua in March 2013 protested against sugar cane companies they believe are responsible for CKDu. As part of a mediation process, the company and a community group representing afflicted families hired Brooks’s team—one of nine applicants—to investigate CKDu’s cause. The group received $800,000 from the sugar company and another $250,000 from the IFC ombudsman’s office for its studies. The researchers assessed everything from industrial hygiene to water quality, pesticide exposure, and biomarkers of kidney damage, comparing people who worked in sugar cane fields with those in factories or other hot settings like underground mines, construction, and shipping ports. The 2012 report from “the Boston group” had a decidedly equivocal bottom line. “Following an evaluation of all available data, our overall conclusion was that the causes of CKD in the Western Zone of Nicaragua were unknown and that the relationship between the disease and [the company’s] work practices was also unknown,” Brooks and his colleagues wrote. But he’s giving it another go. In collaboration with the U.S. Centers for Disease Control and Prevention (CDC), Brooks and his team are launching three new studies. One will assess how working conditions vary by occupation and geography in Nicaragua and El Salvador. A second will probe for genetic susceptibilities. Finally, his team will investigate whether kidney damage begins to occur before people enter the workforce. The nonprofit CDC Foundation will fund the project with industry money: $1.05 million from the Sugar Producers of the Central American Isthmus and $675,000 from Nicaragua’s National Committee of Sugar Producers. Flush with cash to launch more sophisticated studies, researchers may have their best chance yet to understand the baffling disease. On top of the satisfaction of solving a complex scientific mystery and removing the “u” from CKDu, their work raises hopes for interventions that can prevent the damage. And that, in turn, may help Emmanuel Jarquin live up to his promise of “delivering health” each time he visits the sugar cane fields.